To anyone versed in science, the immense range of physical phenomena that can be encoded in Maxwell’s four relatively compact equations is breathtaking. Added to this is the remarkable symmetry between electric and magnetic variables and the fundamental underlying symmetry inherent in the special theory of relativity. 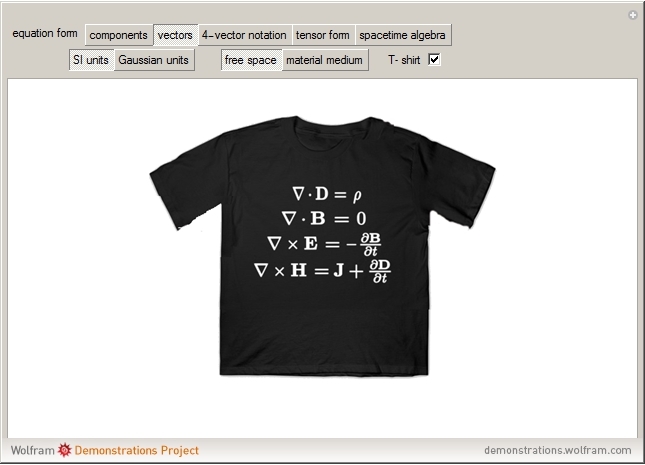 One suggested measure of elegance is whether the equations can fit nicely on a T-shirt. This Demonstration exhibits several formulations of Maxwell’s equations. The least compact form is written as eight partial differential equations for the components of the electric and magnetic fields. These can be compacted to the familiar set of four vector equations. Even greater compactness can be achieved by transformation to four-vector or tensor notation, and the ultimate reduction, using spacetime algebra, expresses the theory as a single equation, written . The equations will be exhibited in both SI and Gaussian forms. Beauty aside, this Demonstration can provide a convenient reference for the various versions of Maxwell’s equations. 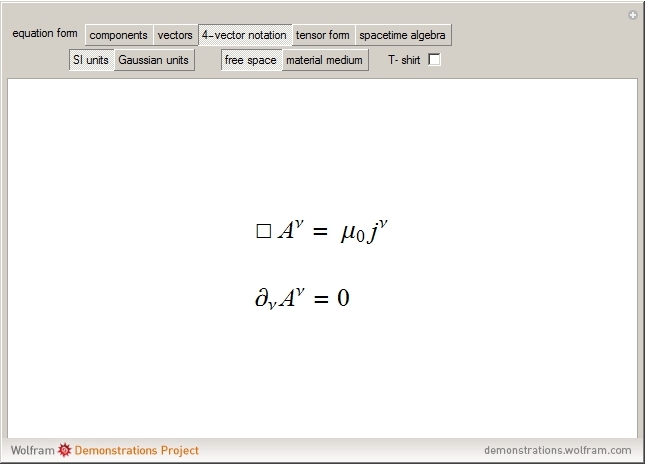 For the component and vector forms, the forms of the equations in material media are also displayed. The physical significance of the four Maxwell equations are: (1) Gauss's law; (2) nonexistence of magnetic monopoles; (3) Faraday's law of induction; and (4) Ampère's law augmented by Maxwell's displacement current. Wikipedia. "Maxwell's Equations." (Aug 27, 2018) en.wikipedia.org/wiki/Maxwell%27 s_equations. Wikipedia. "Electromagnetic Four-Potential." (Aug 27, 2018) en.wikipedia.org/wiki/Electromagnetic_four-potential. Wikipedia. "Covariant Formulation of Classical Electromagnetism." (Aug 27, 2018) en.wikipedia.org/wiki/Covariant_formulation_of _classical _electromagnetism. Wikipedia. "Mathematical Descriptions of the Electromagnetic Field." (Aug 27, 2018) en.wikipedia.org/wiki/Mathematical_descriptions_of _the _electromagnetic _field. 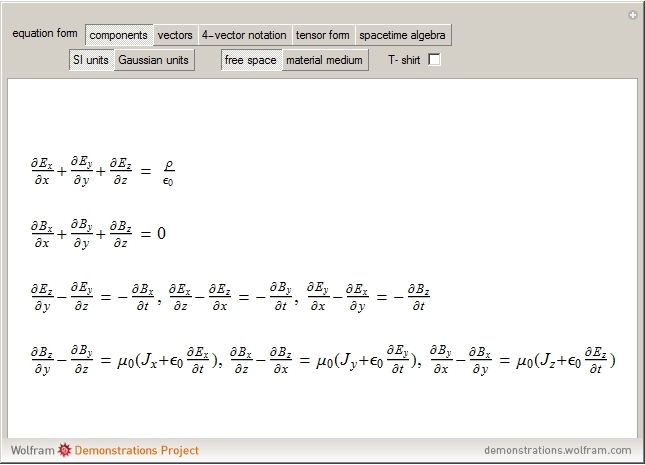 "Alternative Forms of Maxwell's Equations "
Files require Wolfram CDF Player or Mathematica.